Outdoor cooking is not everyone’s specialty, but it can be with the help of Guy Fieri. Impress all your friends at your next barbecue, camping adventure, game day tailgate party or when you are just hanging in the backyard. Guy on Fire has 130 recipes for your outdoor cooking pleasure on your grill. It is full of colorful pictures of mouth watering goodness, helpful tips for planning ahead and the equipment you will be using. The book contains 352 pages and measures approximately 9″ x 8″ to make it a perfect addition to your cookbook collection. 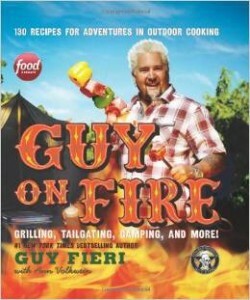 Get the Guy on Fire cookbook today and start putting the “wow” into your dinners and desserts.